Welcome to Precision Auto Body Inc in Frederick, MD. Our auto body and collision shop is proud to provide auto body and collision repair for the Frederick area. 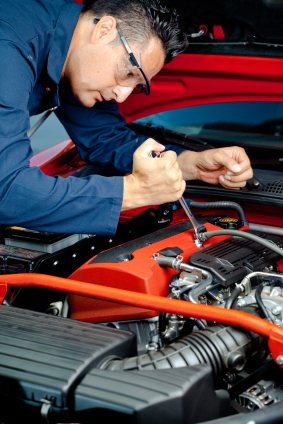 We will treat your car like our own. No matter if you are from Frederick or outside of Frederick, we will gladly provide all the necessary auto body repair services. When you bring in your automobile, you will be greeted by our well-trained estimator. Once arrangements for your vehicle have been made, it is handled by our auto body repair technicians, who will take great care of it and do their best to bring your car back to perfect shape. At Precision Auto Body Inc, our advanced technicians specialize in Auto Body Repair, Collision Repair, Dent Removals and Auto Paint Work. So drop by our auto body repair shop and we will show you, why we are considered one of the best Auto Body and Collision Repair shops in Frederick. "I was extremely pleased with the serivce and hospitality at Precision Auto Body. The paint job is flawless and my restoration of my rims are AWESOME!!! Working with Larry was top notch. I will bringing my 2 Hummers in for touch up painting and rim restoration." This was the first time bringing my car to Precision Auto Body. The damage was extensive to the right side of the car where I was hit making it impossible to open my driver’s side door. I was sure my car would never look the same again. It was my insurance company who referred me to Precision and I’m so glad they did. The car looks perfect and they even cleaned it inside and out. A very nice bonus. My experience in the past is that most companies just do the work, but Precision went above and beyond and the quality of work is exemplary. The people (Larry & Holly) were friendly and helpful and walked me through the steps of dealing with insurance, rental car, etc. Would definitely recommend if you find yourself in need of a good body shop." "Completely satisfied with a complex restoration project on my 20 year old car that other shops simply refused to do. Project involved body work, paint and also suspension and engine work. My service manager Tim was very knowledgeable, helped research and source parts, and went the extra mile to correct things as we went through the project. We have used services of this shop for several family cars over many years and highly recommend them." "Thank you Larry and Tim! Between your awesome customer service and superb body work I am very pleased! I would recommend your body shop to anyone I know. "The quality of work was excellent. Staff is very friendly and helpful." "Precision Auto Body did an excellent job repairing the damage to my vehicle following a fender bender. I can't tell that my car was ever damaged. I was very pleased with the outcome and the professionalism of the employees." "The quality of work is great. I dealt with Precision about a year ago and when another problem arose, I took my car to them. They explained the problems and suggested solutions. I would rate them highly because I didn't feel like the were trying to price gouge me. I asked a lot of questions and they patiently answered everything. This let me know that they know what they are talking about and stand behind their work!" "You can't find better! You will have an opportunity to meet Larry. This is an experience that will undoubtedly exceed any expectations you had about your experience with Precision Auto Body. If you wound up here by chance, you are a very lucky person." "Our car was damaged in a parking garage. Having to deal with the parking garage and the insurance company was a real hassle but dealing with Precision Auto was so easy. They walked me through the entire process and were so helpful and courteous. Larry and Tim, who helped me were great start to finish. True professionals who know their jobs." "The quality of work was top notch, car looks like new. They are very helpful and walk you through the entire process. would recommend them to everyone." "Very professional, most friendly, with excellent repair workmanship completed in very timely manner. Among the very top auto body services and experiences I ever had (in 45 years of driving)." "For someone who finds any work done on my car daunting, I wanted to use an auto body shop that I had some familiarity and relationship with. When my insurance company suggested Precision, I was hesitant, but I couldn't have been happier with any other shop. Precision treated me like family and went above and beyond in the care of my car. I certainly hope I never have to use an auto body shop again, but I'll choose Precision if I must!" "They take the time to do it right, and paint always matches well." "I received the very best service all the employees were very happy and satisfied with coustomer service and repairs." "Quality of the repair was top notch, vehicle looked as good as when it was new, even though the vehicle is 6 years old. Interfacing with Larry made then entire experience SO MUCH better. If he were not there, I might not consider returning in the event of a future accident. His professionalism, joyful attitude, knowledge and social skills are a HUGE asset to your company!" "Kevin, Thank you so much, that was very kind. Happy Thanksgiving to you and your family. Warmly, Larry"
"I would highly recommend Precision Auto Body. They were friendly, knowledgeable, and customer orientated. I was provided with several options for the repair and each was explained in detail. The repair was completed on schedule and I was delivered a beautifully repaired vehicle." "They were awesome and Larry ( the gentleman on your front desk) is outstanding. He is your first impression of the shop and a lasting one!" "Car looks great and Larry was a pleasure to talk to while I waited for my ride." "I felt that I was treated in a very professional and friendly manner. I also cant imagine any body shop doing a better restoration job on my vehicle"
"I am very happy with the quality of work on my 4 Runner." "very friendly, excellent work, attention to detail"
"I'd tell them I don't believe anyone could do it better. The work was exceptional and the staff could not have been more helpful or friendly." "Precision is the best around Frederick. Friendly staff and great work! Wouldn't go to anyone else for my auto body work." "All work done as specified and very well." "Great work, VERY customer oriented. Bob at Precision is great, he always kept me up to date about everything, was always available when I called with questions, and just generally seems like a nice, fair, good person. Would recommend!" "Excellent work and excellent service. Always very pleasant to deal with." "Precision is an outstandingly good place to take your car or truck for autobody repair. They do excellent work and stand behind it." "Repair work was excellent, exactly what I requested, and at a good and fair price"
"The car looked and smelled as it did when i first bought it 1 year ago.Larry at the front desk took care of me,Kim was my favorite in the office,she told me the information i needed to know about my car.Larry kept me updated every couple of days.Hertz provided a rental car for me...a nice car too:)"
"Precision Auto-body Inc. has a great business,they're fast and i cant believe how my car came out,finished,shiny,and clean. I like how they treated me with loyal.I came in for check in and to sign some papers,and they gave me all the info i needed to know.They kept me updated on when a part came in for my car. I will definitely recommend this body shop." "You all were amazing. Kept me inform as to what was going on with my vehicle. You even cleaned/vacuumed my car. It came back to me in better shape than when I dropped it off. Thank you so much! I will definitely recommend you to friends and family." "The car looks like it did when we first bought it. I would like to mention the outstanding customer service we received from Larry Geiser while our car was being repaired." "Larry, the person who greeted me, provided an estimate and explained what was going to take place and provided an accurate schedule... MADE the whole experience wonderful. The work was top notch, but the customer service is what will make me return." "They did a great job. Very good communication with the customer. This was a repair from an accident. When the discovered more damage than the original estimate and payout from the insurance company, they contacted the insurance company directly and handled everything." "Everyone is extremely helpful and helped to make a bad situation manageable. Very good handling details with the insurance co. and communication in general-great customer service!" "The staff at Precision Auto Body was very professional and kept me updated about the progress on my vehicle. I'm very satisfied with their work. If I need to have my car repaired again, I would definitely get them to do it." "Excellent experience all the way through." "Very helpful and friendly. Excellent work. Talk to you about what needs to be done your vehicle in detail. This was my fourth visit. They have fixed two different vehicles of mine and I have been very happy with the results." "PLACE TO BE EXCELLENT WORKMANSHIP AND GREAT CUSTOMER SERVICE." "The work is superior and the customer service exceptional"
"Very good service and work"
"Quality of work is the very best I have ever seen. They go the extra mile to satisfy a customer. Service is ,tops!!!" "That they did a great job on my car and that I highly recommend them"
"Precision Auto Body did an great job making my car look new again." "Quality of work is good. and holding up so far"
"Customer serivce is great! Larry and Tim are the best to deal with and the quality of work is "outstanding""
"Good friendly staff, who has access too a paintless dent repair guy that works magic!" "Fantastic service and just plain nice folks"